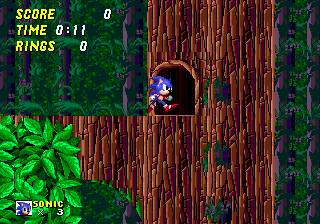 Wood Zone, one of the surprises to come out of Sonic 2 BETA. Unlike Hidden Palace Zone, Wood Zone was never [or hardly] heard of at all. It was cut off early in the development cycle, but survived long enough to be in this version. The level is very unfinished. Most platforms have no 'top' to them, and just look cut off awkwardly. 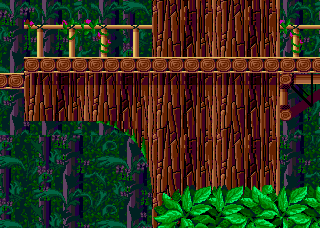 A continuous background with no paralax is in the background, and a leaf texture is used around the place. There are 2 different types of ramps, both a long curve and a short curve. These doors are scattered around the place, along with small holes in the wood between them. What you'll notice is that it's very similar to the warp pipes found in Metropolis Zone, even the holes are in the same place. 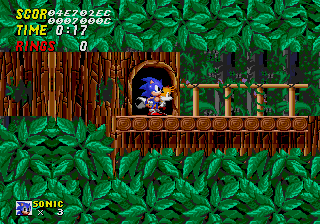 This aspect brings up the theroy that when Sonic 2 was supposedly about time travel [later given to Sonic CD], that Wood Zone is the past of Metropolis Zone. A Forest, later burnt down into a Metallic Fortress makes sense as well. 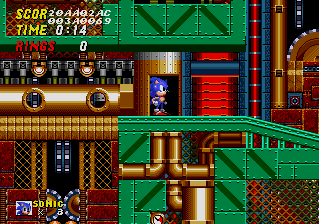 The song played during this level is also Metropolis Zone. These minature platforms are also surrounding the level. 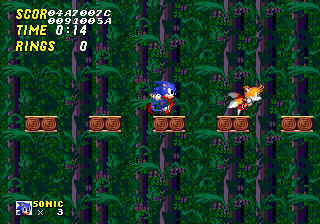 Sonic can easily walk over them without falling if he is at his top speed. 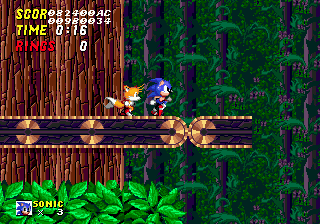 These conveyor belts are also near the end of the Wood Zone map. They don't work, but are completely animated. This also gives the Past Metropolis Zone theroy more backing. AJ has created a complete map of the Wood Zone area, click the image for the full size.